I couldn't have asked for a better way to start off 2014 than a two week trip to South Korea with four of my best childhood friends. On the second evening of the new year, I arrived in Seoul, a metropolis that is now easily one of my favorite cities in the world. The city is clean, food is mostly inexpensive and the people are kind, not the usual descriptions of such a hustle and bustle kind of place. For our first few nights in Seoul, we stayed at a guesthouse in Hongdae, an area known for it's night time street life and its proximity to Hongik University. 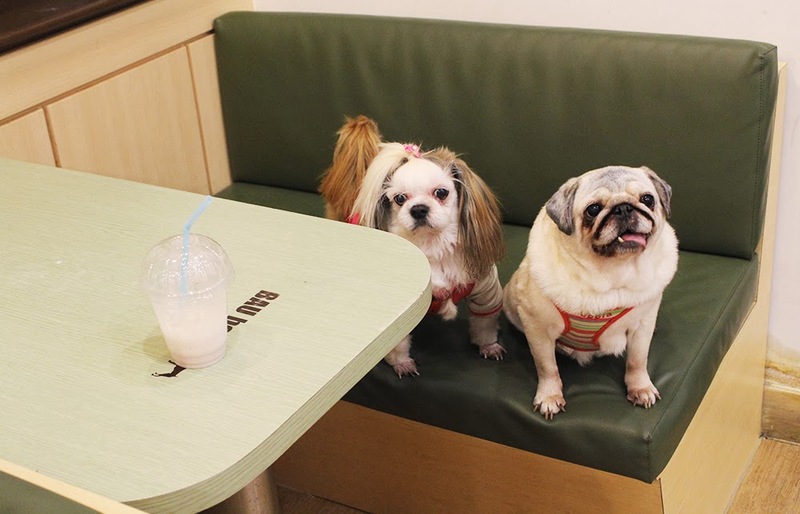 But a few streets away in a rather corporate looking, high-rise clustered neighborhood, you will find Bau Haus Dog Cafe, an adorable place to mingle with alaskan malamutes to corgis and the quality of the green tea lattes are an afterthought. The range of personalities here is great as you'll find lap dogs, hyper dogs and sleepy dogs. Kami, an energetic black lab, was all about jumping to and fro at our booth and drooling all over. Dam, a baby-faced golden retriever calmly awaits head pats and doggie treats. 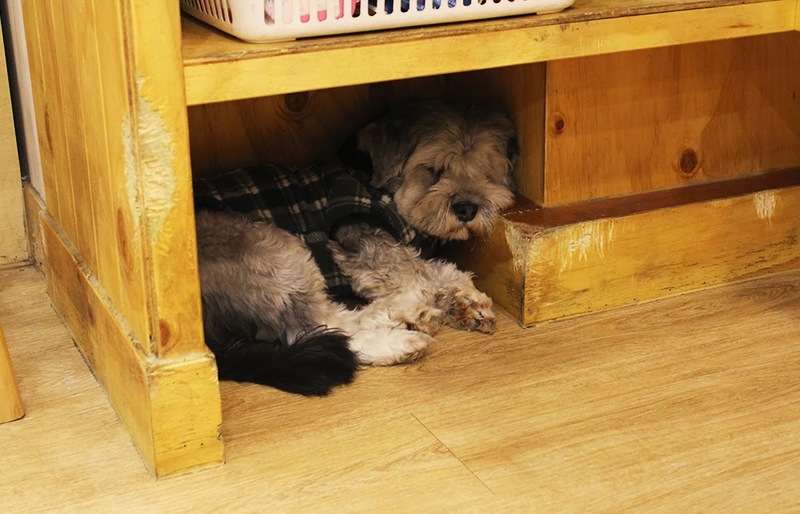 This little guy would be an example of a sleepy dog who was smart enough to find a little nook to get away from all the children who go to the cafe after school. 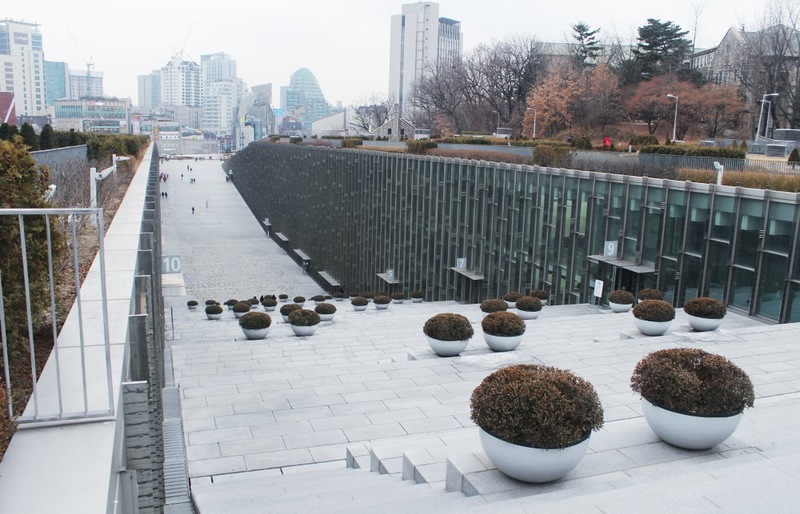 Afterwards, we headed to Ewha Womans University, one of the most distinguished universities in South Korea with an impressive campus that fuses sophisticatedly curated natural elements with modern architecture. 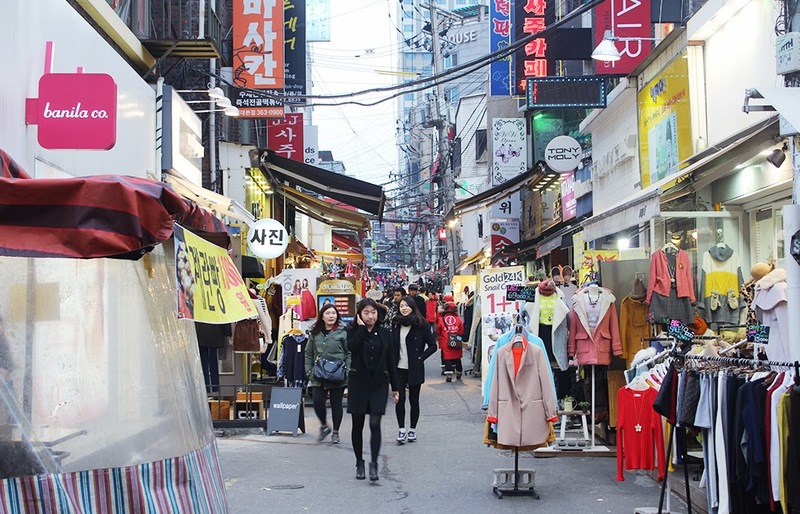 Edae is the area around Ewha and offers inexpensive fashion finds for young women. Cute sweaters can go as low as ₩5000 (a little less than $5). The only downside would be that a lot of the shops have the same or similar options because they probably have the same suppliers. 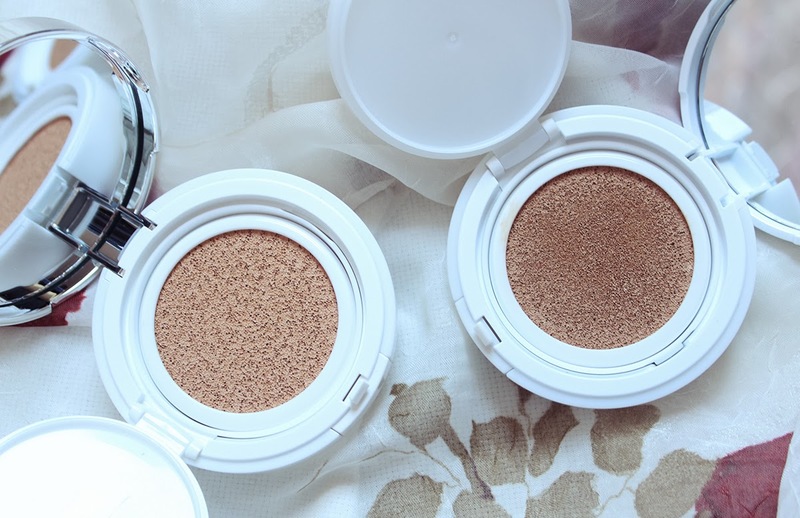 Definitely look around all the shops before purchasing because you might be able to find the same item for a lower price! 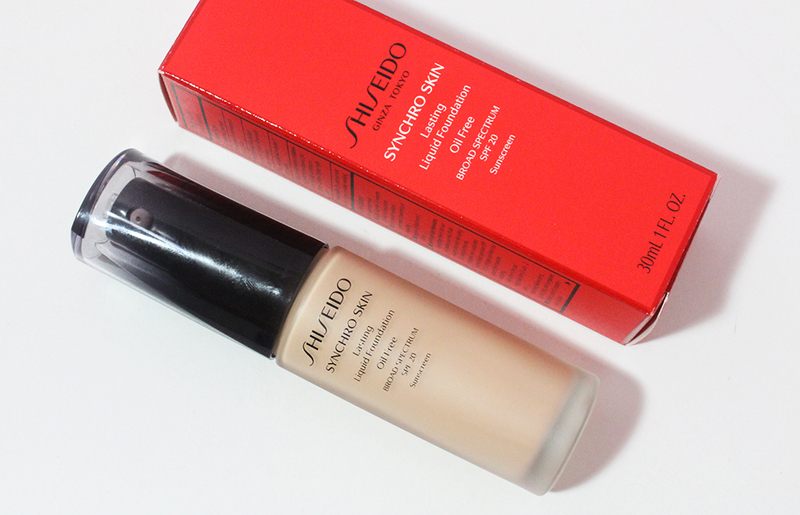 Beauty chain stores are also rampant in this area but you can find them easily in any neighborhood of Seoul. 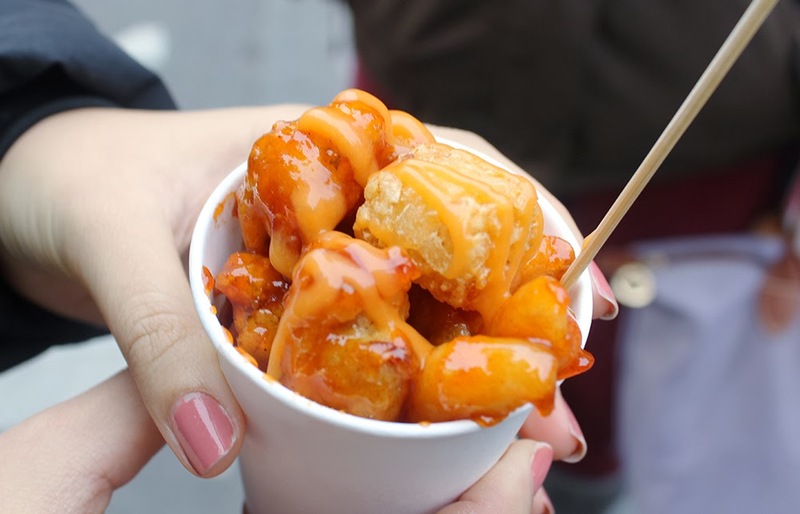 The street in Edae that leads to the entrance of Ewha is lined with street vendors selling tasty treats. One of my favorites is "cup chicken" which is spicy fried chicken with "dduk" (korean rice cakes). A small cup will only set you back ₩1000. If you want to explore Seoul inexpensively, a budget of ₩15,000 per day for food is definitely doable. 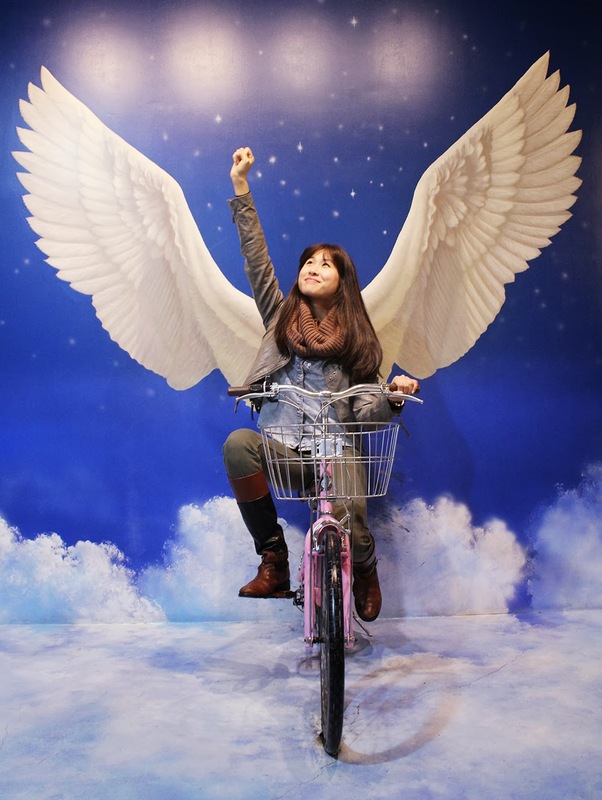 On another afternoon, we paid a visit to the Trick Eye Museum where you can take whacky pictures with props and 3D wall paintings. My friends had a lot of fun but the experience was a bit cramped because there were a few tour groups who were also visiting. There is also an Ice Museum in the same building which is worthy of a visit too because the admission is included. Afterwards, we hit up Gangnam (queue PSY song) which is known for being a more upscale area in Seoul. The main avenue reminds me of Fifth Avenue but take a detour to the smaller streets and you'll find an abundance of quirky cafes and restaurants. 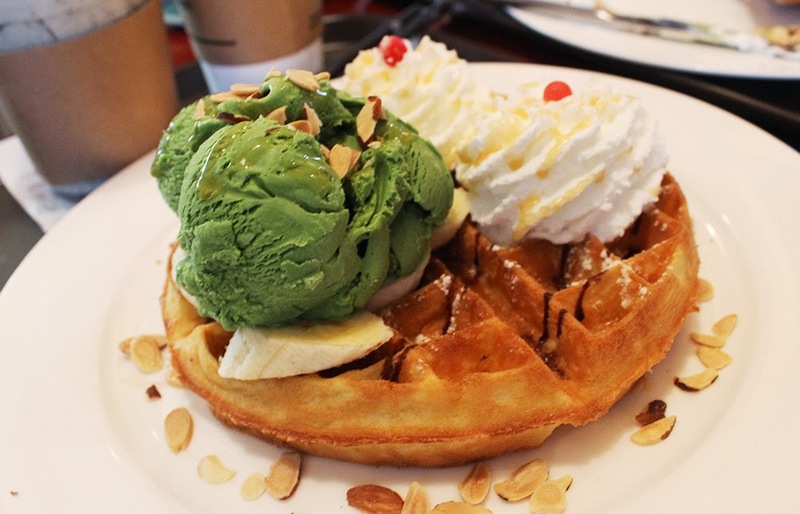 Waffles loaded with ice cream are very popular in Korea and can be found everywhere. I had a yummy black sesame latte and split a waffle with green tea ice cream at Standard Coffee Bar in a hilly area of Gangnam. At night, we headed to Lotte World, an indoor amusement park. I put my DSLR in a locker so I only have this grainy image from my phone to give you an idea of what the park looks like. Lotte World is really popular for families with young children and couples on dates. I felt like a kid again and was surprisingly impressed by the size of the place. It's no Disney World but it's a cute place to go if you want to let loose and go on a couple of rides with friends. Of course, aside from the bright lights and materialistic attractions of Seoul, traditional elements also played a major role in this trip. What could be more traditional in Korea than kimchi? To be honest, I can't remember the last time I had kimchi before going to Korea but I think I ate it at least once everyday throughout the two weeks. 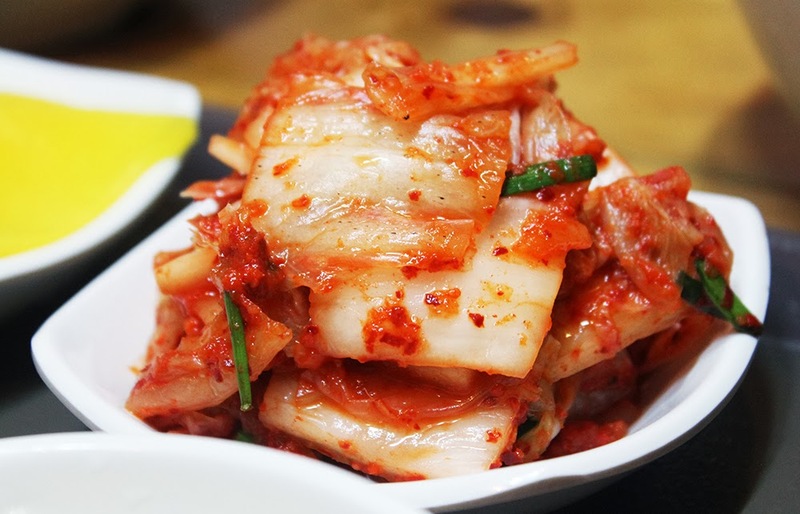 Kimchi is often given as a side dish at any sit down meal and the fermented cabbage is a nice dish to snack on before your main meal arrives. I barely ate any veggies or fruit during the trip and had to rely on kimchi for some much needed vitamins and fiber. 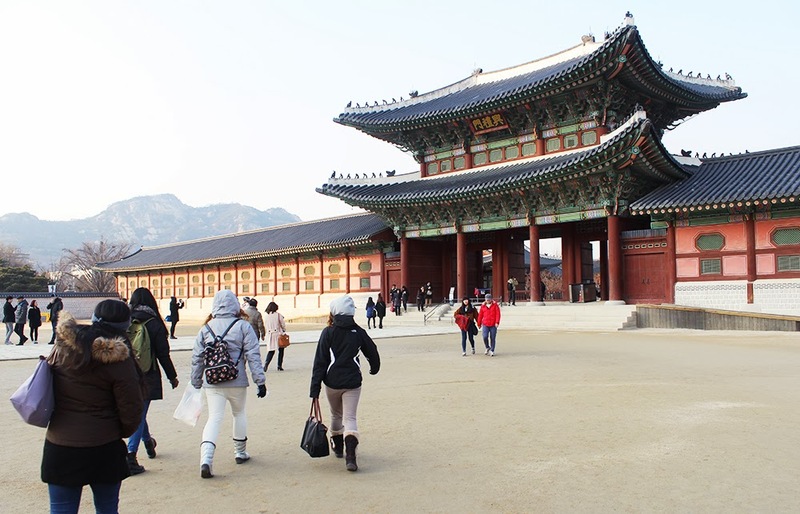 On a brutally cold day, we visited Gyeongbokgung, a palace in Seoul that was originally built in the 14th century but was destroyed and rebuilt multiple times over the centuries. It was a touristy activity that probably would have been more enjoyable in warmer weather. If you can find a quiet corner within the palace grounds, you can imagine yourself transported back many years to a simpler time. From Gyeongbokgung, we made our way towards Gwanghwamun Square which features statues of King Sejong and Admiral Yi Sun Sin. The square is a wide swatch of flat paved street but the real attraction is underground. An interactive museum dedicated to King Sejong and Yi Sun Sin are located right under the statues and were a great escape from the bitter cold. I'm ending this post with some more yummy streetfood! I didn't even know Koreans had their own version of Japanese tempura called "twigim". 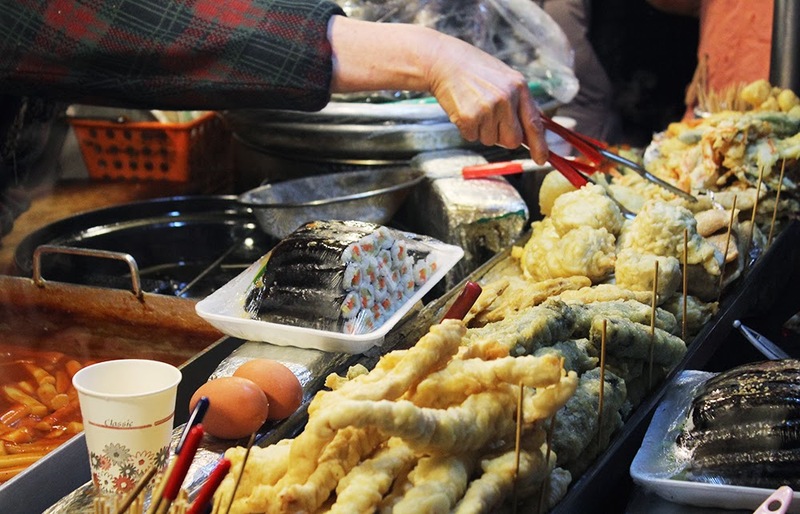 The deep fried squid, seaweed roll and "mandu" (dumplings) are my favorites. The usual price is five pieces for ₩2500. 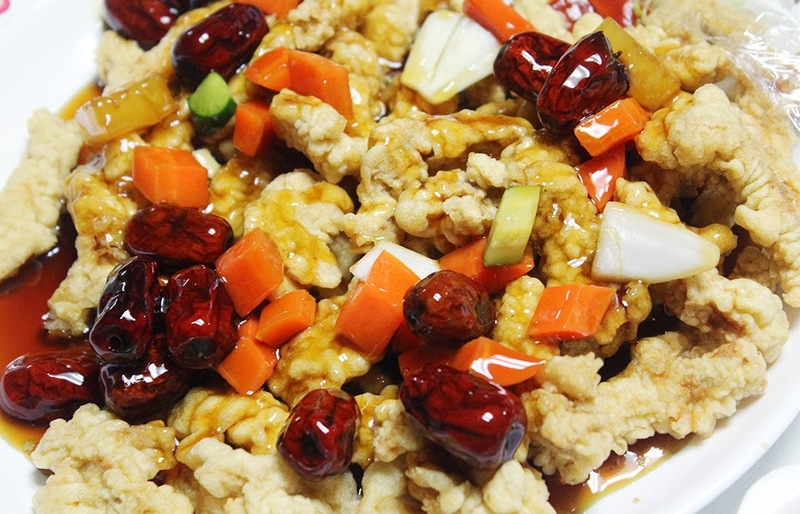 "Ddukboeggi"(spicy rice cakes) is another favorite and is usually only ₩2500 for a plate. On our last evening in Seoul as a five person group before heading to our next destination, we ordered in our dinner to the guesthouse. We got "jajeongmyun" (black bean noodles) and "tangsuyuk" (fried pork with sweet sauce). I found it so amusing that Korean delivery food comes in regular eating plates and the delivery guy will come back the next day to collect the empty dishes. The jajeongmyun was really delicious and the tangsuyuk was a great dish to share amongst friends. We ate while watching Korean game shows without subtitles and having our friend who speaks Korean translate everything. 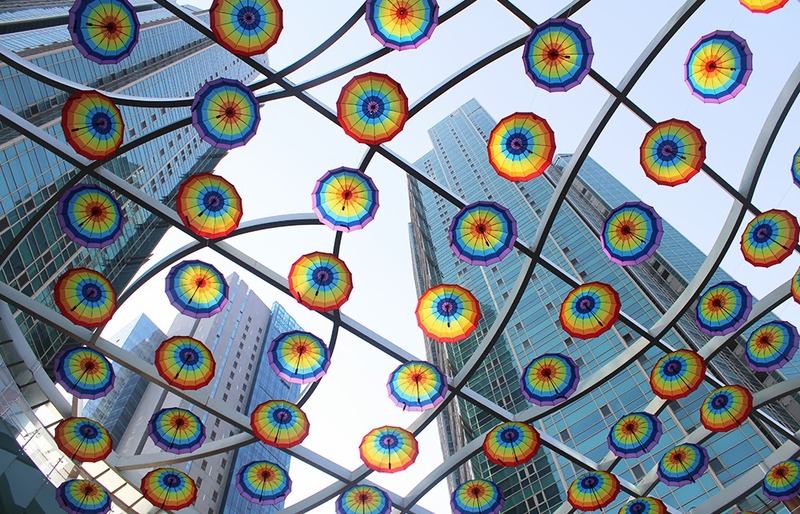 Stay tuned for part two of my South Korea travels where I'll show you a bit of Busan, the second largest city in Korea!